When you can’t eat, it’s impossible to not realize what a large role food plays in your daily life. From preparing food, buying it, meeting friends out for lunch, hanging out at a neighbor’s house, planning your next activity, or any other thing you can think of… you name it and food is there. Food is central to so many of the things we do, and when it is taken it away, what the heck do you do with all this new found free time? Take away meals and suddenly your have time to watch four movies in a day and read a few books. Lesson #2: Experimentation is a good thing. There was certainly no shortage of people telling me how crazy I was or what a bad idea it was to drink only juice for three days. In fact, Mario was the only one telling me to stick with it even when I wanted to gnaw my arm off. I did this fast because I wanted to see how my body reacted. My body is not the same as anyone else’s on this planet (hooray! ), and if I don’t try, how will I ever learn what works (or doesn’t work) for me? That is a lesson that can be applied to so many aspects of our lives. We rely so much on what people tell us…. run this many days a week to avoid injury, this is the best exercise to prevent runner’s knee, eat 3 times a day, eat 6 times a day, cardio before weights, weights before cardio, and the list goes on and on. In order to decide if any of this information is true or false, isn’t it almost necessary to experiment? Of course there is value in learning from other people’s experiences. How else are we going to know what to experiment with? But my take away from this fast is that in order to know if something works for my body, I have to try it out… on my body. Lesson #3: A lot of things in life are like a marathon. When I decided to do the juice fast, I knew it would be hard, but I wanted to do it. Kind of like a marathon. Day one wasn’t so bad. I was excited and ready for the adventure that awaited me. Just like the first 13 miles of a race. Day two was hard. I was stuck in the middle. Too much invested to turn around and not close enough to see the end. It sucked… like miles 13-20 of a marathon. Day three was hard but I knew I was going to make it to the end. The fact that I would be able to say I successfully completed my goal was motivation to keep going, no matter how hard the remaining hours would be. The end was approaching and I knew I would finish… just like miles 20-26.2. During my time between watching movies and reading a book, I began to think about just how many of our obstacles and adventures in life are exactly like this. Exciting at first, really crappy in the middle when things get tough, but exciting, inspiring, and motivating when the end is in sight. Sometimes the hard part may be 24 hours or 7 miles or perhaps even years, but if we persevere, we will see it through, whatever that “it” may be. There is an amazing juice bar right beside work and I absolutely love it. I had never been much of a veggie juice person before, mainly because I had never tried it. However, since trying the many fruit/veggie combos at Juiced Up, I can’t imagine my diet without them. Today, Mario and I had a class with Liz, one of the owners of Juiced Up who was kind enough to sit down and answer all of our questions. Why juice? What type of juicer should we buy? How do you make juices? 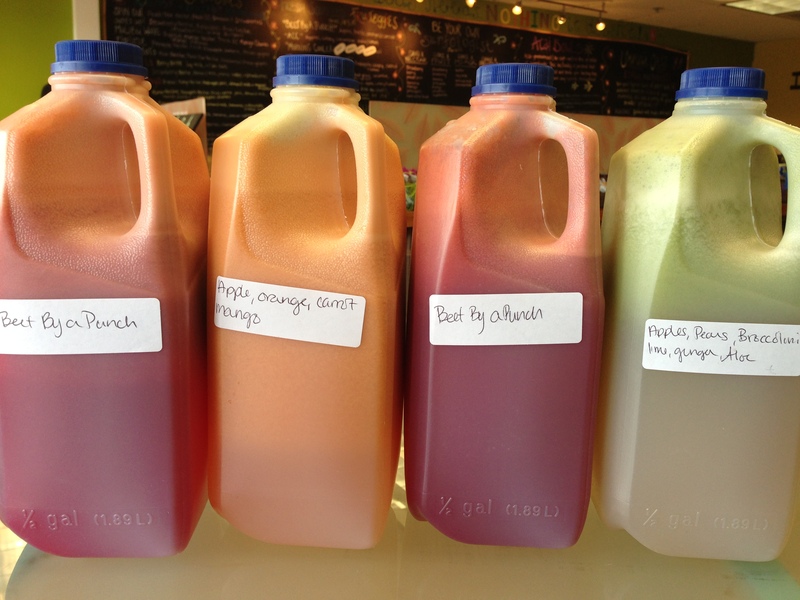 How do you do a juicing cleanse? It was quite informative and I am sold now more than ever on the benefits of juicing. In my mind, I can’t understand why anyone wouldn’t want to juice. First and foremost, it tastes absolutely delicious! It’s not the nasty V8 stuff you think about it a can. The juices are light, sweet, and super easy to drink. Second, juicing does so many great things for your body. It heals you from the inside out and gives your body exactly what it needs… lots and lots of micronutrients. Juicing also detoxifies the body, which I’m sure we could all use. The way I think about it is the following: Your body is like a factory. Put a bunch of crap into your body, and your factory starts to break down. Your cells are weak, your organs aren’t functioning properly, and pretty soon everything on the outside starts to get affected. Low energy, bad skin, restless nights, etc. However, if you give your body all the micronutrients it needs, your factory is booming. Your cells are happy, your organs are happy, and everything on the outside is glowing. Liz, the owner of Juiced Up, is an excellent example of this. She is always beaming with positive energy and has a radiant glow about her. She does a reboot every Monday and juices twice a day. Juicing takes times. That is a given, but your body deserves a little kindness. Sure, it’s is not the same as eating the fruits and vegetables but who says you can’t do both? Juicing just allows your body to be flooded with micronutrients, and for me, it helps me to get my veggies for the day. Since I’ve been juicing more, I’ve cut down drastically on my meat consumption. I’m loving the way I feel – even more energy, well rested, and overall, just very positive. We plan to buy a juicer next week. Look at all this goodness! I had my first juice with aloe vera today… yummy! Running Update: Well today wasn’t the 12 miler I was hoping for. I did a slow 2 miles with a new member to our run club (super awesome lady!) and then did another 10. The workouts from this week have made my legs feel a little heavy, and I could really feel the fatigue. Tomorrow, I will only do strength training and stretching. Stats are here (warm up miles) and here. In addition to teaching Spanish, I also lead the CHS Wellness Club at school. We do yoga, learn about nutrition, and drink veggie juices. I love it. (I’m also trying to organize a 3 mile run/walk fundraiser for the One Fund Boston but am still waiting on approval.) Today, the local juice bar provided us with some samples of delicious veggie juices (kale, carrots, apples, celery, lemon, and all sorts of yumminess) and we watched this great video on alkaline vs. acidic foods. The impact it had on my students was profound and I think it’s worth the 9 minutes. As I told them at the end of the meeting, go PLANT POWER! I don’t plan to go vegan again but I need to get on board with a few more veggies in my diet. I mean. if I plan to live to be 100 (God willing), I certainly want to be as healthy as possible Less meat. More veggies! Lately Mario and I have been watching quite a few documentaries. Most recently we watched Forks Over Knives and Vegucated. If anything ever made me want to go vegan again, it would be those two films. The power of plants is undeniable and as a wannabe really fast runner, I’m starting to question my diet choices. Now don’t misunderstand me… I eat much healthier than your average person. I don’t do processed foods, my sweets consumption is limited to organic dark chocolate and my two worst habits are peanut butter and plantain chips. However, as I start to think about it, I don’t think I get enough nutrition from plant based foods. My typical veggie intake consists of spinach, carrots, cucumbers, avocado, onions, and maybe mushrooms. It never ventures far from this path. After reading this article from Scott Jurek, one of the most dominating ultrarunners of all time, I think I need to revisit the issue. [After going vegan] my performance wasn’t the only thing that improved. When I went vegan, my blood pressure and triglycerides levels dropped to all time lows, and my HDL, or “good” cholesterol shot up to an all-time high. I had virtually no joint inflammation, even after miles of pounding trails and roads, and on the rare occasions I sprained an ankle or fell and whacked my elbow or wrist, the soreness left faster than it ever had before. So it turns out, an athlete, even one who trains up to eight hours a day, can do just fine with a plant-based diet. It also turns out that spending a little more time and money to eat healthy is incredibly cost effective; I think of a plant based diet as essentially the cheapest health insurance around. Being vegan wasn’t a matter of subtraction, but addition. I discovered foods I had never known existed and experienced flavors and textures I had never imagined. Have you ever tasted a juicy lentil mushroom burger, or a savory bowl of veggie chili? If not, you should. That’s something to think about: A delicious, affordable diet that will make you healthier and support the most difficult physical challenges you could ever encounter. Now that’s shocking. I have a problem and unfortunately it comes in the form of peanut butter. 190 calories, 16 grams of fat, 8 grams of protein, and that’s just for one serving. But who can really stop at just one serving of peanut butter? I certainly can’t. 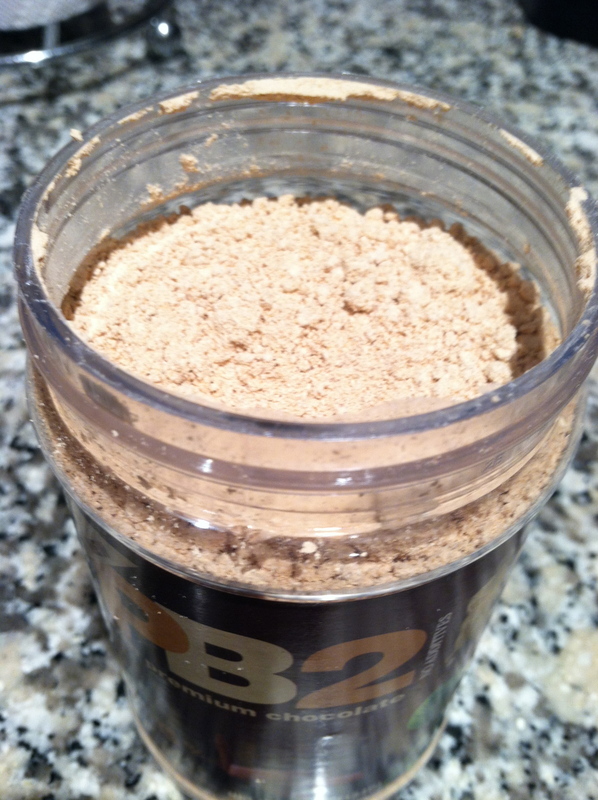 A few weeks ago my dear friend Emily brought us a sample of PB2, a peanut powder. To turn it into actual peanut butter, just add 2 tablespoons of powder and one tablespoon of water and voilà, you have peanut butter. The best part? It’s only 45 calories, 1 grams of fat, and 4 grams of protein. Now no, it doesn’t taste exactly like delicious fresh roasted peanut butter, but it’s quite similar. And there is even one with chocolate. Ingredients include peanuts, cocoa powder, sugar, and salt. Deliciousness. You really can mix this stuff with any liquid you want. 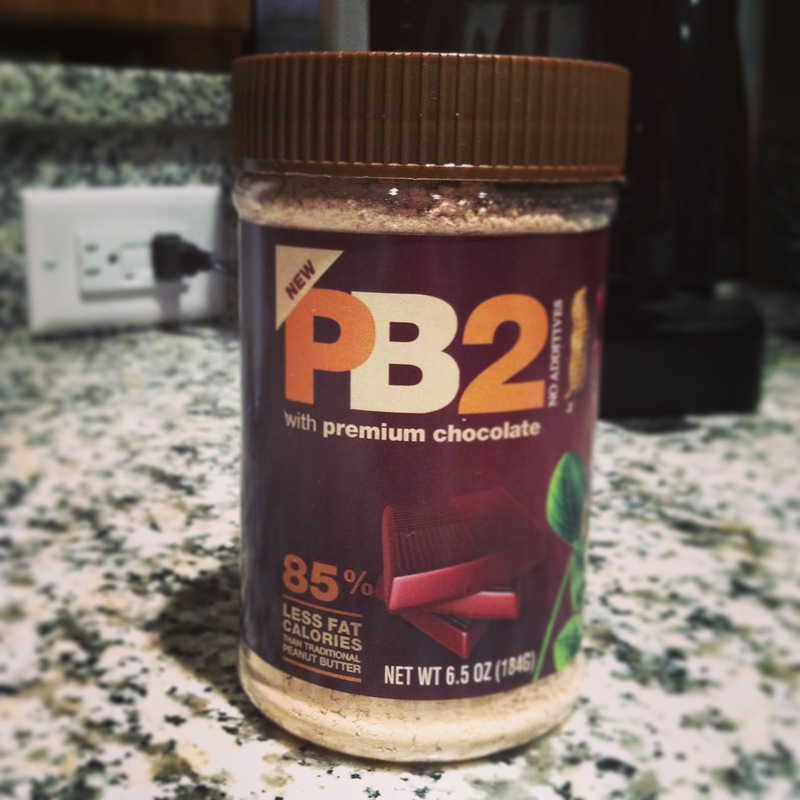 You can add it to smoothies, oatmeal, or even to your baking. It’s yummy, 85% less fat calories than regular peanut butter, and convenient. Thanks Emily for the sample! I now have a new problem, but at least it’s less fattening. Recovery Update: I am actually feeling a lot better today. Hip is still sore but I feel like my back has opened up a lot and I’m doing a better job of engaging my lower abs when I walk. I’m crossing my fingers I can start some active recovery runs next week. I feel like not enough people know about the awesomeness of kefir. I’ve only known about it for a year or so but it is now a staple in our household. Kefir is basically fermented milk that tastes a little on the sour side. It can be made from any type of milk and it is full of nutrients, probiotics, and awesomeness. Besides containing highly beneficial bacteria and yeasts, kefir is a rich source of many different vitamins, minerals and essential amino acids that promote healing and repair, as well as general health maintenance. Kefir contains high levels of thiamin, B12, calcium, folates and Vitamin K2. It is a good source of biotin, a B vitamin that HELPS the body assimilate other B vitamins. The complete proteins in kefir are already partially digested, and are therefore more easily utilized by the body. Like many other dairy products, kefir is a great source of minerals like calcium and magnesium, as well as phosphorus, which helps the body utilize carbohydrates, fats and proteins for cell growth, maintenance and energy. Kefir is a source of vitamin K2, which apparently is lacking in most American diets. It can also help protect against gastrointestinal disease (it has a LOT of microflora) and can improve lactose digestion. A 2003 study of 15 adults who had difficult digesting lactose, found that drinking kefir reduced lactose maldigestion symtoms by 70%. That’s a big deal if you like your occasional piece of cheese. But perhaps the best reason I like Kefir is it makes an amazing spinach smoothie, way better than almond milk, soy milk, water, or anything else. If you’ve never tried it before, go for it. Just be sure to get the plain kind. There is so much sugar in the fruity one. .
Running Update: Well I ran today. The thing that is killing me is aerobically, I feel awesome. A 7:12 mile feels very normal and easy for me. However, my leg is another story. I can definitely tell my left side is opening up. I am running like I should be. But it feels like my leg isn’t use to running this way (the right way). Therefore, there is a lot of stress on some of my leg muscles. Maybe if I take a lot of Advil before the race, I’ll be fine. Saturday is soooooo iffy. Stats from today are here. Oh diets… always changing, always evolving, and always something new to try. CNN recently published this article about diets throughout history. There are two things I took away from this article. First, diets have been around for a long time. And second, there have always been crazy diet trends. In my opinion, some of the more interesting trends mentioned in the article, dating all the way back to 1820s, are the vinegar and water diet, the tapeworm diet (which involved swallowing a parasite packed pill), the Sleeping Beauty Diet, the cookie diet, and Beyoncé’s Master Cleanse Diet – hot water, lemon juice, cayenne pepper, and maple syrup. You can read the complete article here. If I had to venture a guess, I’d say some of the crazier diets, such as the tapeworm diet, were not sustainable. Something tells me the side effects of swallowing a parasite would be much worse than a few extra pounds. And the Sleeping Beauty Diet? Well I guess that explains why Aurora was so thin. Either way, no matter how many extra pounds I may put on in life, I’m not swallowing a parasite, being sedated for days at a time, or drinking water and vinegar. I think I’ll just go outside and run. It just seems a little more practical. Running Update: Last night I may have slept 2 hours. I pretty much expect to see a six pack tomorrow due to the fact my abs are so sore from all the coughing. I didn’t go to work and slept another 4 hours this morning. On the plus side, after my kombucha and a visit to Dr. Molly (my chiropractor), I feel so much better! I’m even expecting to get a run in tomorrow (fingers crossed). Dr. Molly put me through some intense Active Repelase Therapy which was no fun for my sore abs. And I got my bib number today, #5384, so that got me excited for Saturday, no matter what happens. Ryan Hall recently released a PDF document of his recommended diet. Because I’m always looking for that edge, I was ready to make my grocery list and head to Trader Joe’s. Well it turns out I already eat 95% of what he recommends. (YAY!) Kale, beets, kefir, avocado, sweet potatoes, eggplants, bananas, eggs, cottage cheese. They are all in my refrigerator, with the exception of beets. (I prefer beet juice instead.) And the best part? Also, his recommended dinner includes sweet potato fries, my absolute favorite! And his bedtime snack is oatmeal with almond milk. Well if I’m not eating peanut butter before bed, I’m eating a bowl of muesli (which includes oats) with almond milk. Perhaps it isn’t the best idea to eat that much before bed but whenever I’m running a lot, I’m pretty much hungry every 2 hours. The main thing that I do not include in my diet, that Ryan Hall does, is Muscle Milk. There is something about the fact that it is called milk, but doesn’t include actual milk that bothers me. Plus the Muscle Milk light includes fake sugar. That’s not my thing. Running Update: Over the past 24 hours, my hips have popped, cracked, and stretched every possible way. Literally, my bones are sore. However, my body feels much more in alignment and my hips feel better. We pushed my track workout to Thursday to give my body a little more recovery time. I ran an easy 6 miles today and made sure to go slower than yesterday. Other than my sore bones, everything went well. I’m amazed at how easy the miles feel. 8:00 pace and I felt like it was more of a jog. Now if it can just stay that way for 1 1/2 more weeks. Stats are here. I believe in whole foods eating. Any opportunity I see to promote the idea, I do it. (I’m a little more tactful now with my approaches.) However, I’m often met with the response everything will give me cancer or Doritos just taste so good or healthy food tastes so bad. Those comments literally make me want to hit my head against the wall. Granted, as a young teenager I ate crappy food all the time. McDonalds, Wendy’s , Bojangles, you name it. But that was because I didn’t know any better. I thought that was the norm. How can I get people on the whole foods eating bandwagon with me? Well I found this beautifully written article by Rachel and how clean eating not only saved her from cancer, but changed the lives of everyone in her family. All my life I poked fun and laughed at “crunchy” people. I thought natural food stores were weird and smelled funny. 🙂 I would see the headlines everyday, about the “latest this or that, that may cause cancer” and think well, is there anything that doesn’t? Do I just quit enjoying life because I “may” get cancer? You can read the entire article here. To sum it up, Rachel has a much healthier life, is cancer free ,and her mom is now able to travel, move, and actually enjoy life. Kudos to Rachel and her family. What are your thoughts on whole foods eating? Running Update: Oh running how I’ve missed thee. After lots of stretching and praying to the Running Gods, I was able to get a speedy 6 miles. I did have to make an effort to focus on my pelvis and hip alignment but aerobically, I felt amazing. I ran 6 miles in 43:53. Stats are here.